Thanks to Paula for updating us on her husband Chuck's health progress. One of the things I really appreciate about our Shaklee family is when we get updates on how people are doing - beyond their initial story. DISCLAIMER...The statements made on this blog have not been evaluated by the Food and Drug Administration. These products are not intended to diagnose, treat, cure, or prevent any disease. Rather the statements made are what some folks have experienced personally. 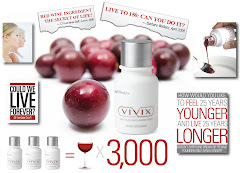 Below is a story about my husband and his experience to date on Vivix, Shaklee's anti-aging tonic. He has been on various Shaklee supplements since 2001, but we have seen the most change since starting Vivix August 2008. The improvements became noticeable within 2 months of starting Vivix. Before Vivix, our goal was to keep him as healthy as possible so his body only needed to deal with Parkinson's. Since Vivix, our goal has changed to improving his DNA and reducing his medications! Then use his personal experience to help others. I often reflect on why God put Shaklee in my path – and it’s times like this when I hear the answer. I am 58, Chuck is 78. We’ve been married 24 years. He is the love of my life. What I didn’t know way back before we met, was that I was in love with him even before I knew he existed. Do you know what I mean? That’s the kind of relationship we have. In 2003 Chuck was diagnosed with Parkinson’s Disease – a progressive neurological disorder with no known cure. When you hear Parkinson’s you may think of Michael J. Fox, or the former Pope, who lived with Parkinson’s for many, many years. Chuck has a very relaxed attitude about his PD, he figures something would eventually get him, and it could be worse. Chuck has been taking Shaklee supplements since 2001 and is on prescription meds for the PD. I’ve done a lot of research, talked with others, and have him on a pretty solid Shaklee program – which we are constantly tweaking as we learn more. I brought Vivix home from convention and Chuck began taking it mid August and has been faithful with it every day! He promised me he would do that for 6 months before making any decision on whether to continue it or not. Keep in mind, my darling husband is my very best skeptic! 6. and the best of all – when you look into his eyes, his lights are back on! Is Vivix making a difference in Chuck’s health and in our hope for him? You bet it is! And is he going to keep taking it after his promised 6 months? He better! 1/09: Chuck had cataract surgery in both eyes in Nov. and Dec., then eyelid lift surgery early January. At his one-week checkup after the last procedure, his surgeon said, “You are healing much faster than I expected!” Most 78 year olds don’t hear that! I think it’s the Shaklee! 2/09: Chuck had his 6-month check-up with his neurologist in January. With reluctance, he agreed to have Chuck go off one of his two PD meds, Sinemet, which he had started April 2008 to help with the increased tremors and other symptoms. We think that drug may have been partially responsible for the atrial fibrillation that was found in October (one of the side affects is heart irregularities but neither the cardiologist nor neurologist would agree that was a factor). We have not seen an increase in his PD symptoms since stopping Sinemet. He had a re-check with the cardiologist late January and the atrial fibrillation/congestive heart failure was downgraded to a heart flutter (Thank you Jesus!). Chuck is also on a nutritional and detoxing program designed by Dr. Richard Brouse, chiropractic physician, biochemist, and certified clinical nutritionist in Oregon, working with him long distance. The Build a Better You program includes extensive blood, hair, and urine testing, with a program designed specifically for Chuck’s results. After much research and evaluation, Dr. Brouse has chosen to work exclusively with Shaklee products.